A team of enterprising scientists from the School of Pharmacy who have devised a way to detect and treat head lice, have scooped top prize in a business competition for biotechnology start-up companies. The Biotechnology Young Entrepreneurs Scheme (YES) sees early-career researchers from biosciences develop skills and learn about taking their research into the marketplace. It is run alongside Environment YES which is open to researchers from the environmental sciences. This year the competition attracted 75 entries and it is the first time The University of Nottingham has taken the top prize. The winners of Biotechnology YES were ECTODECTO are from the Centre for Doctoral Training in Targeted Therapeutics and Formulation Sciences. Their idea was a new way of detecting and treating head lice infections. 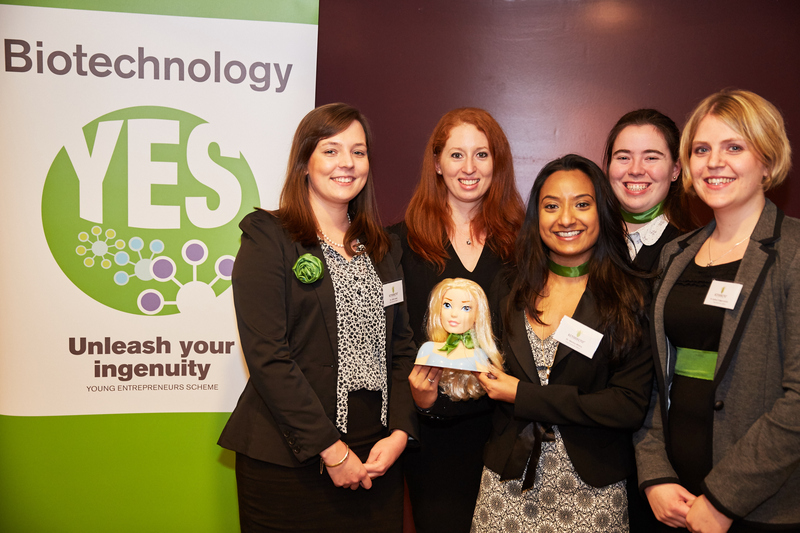 After qualifying from regional heats to reach the finals, the winning team from Nottingham pitched their hypothetical company to a panel of expert judges, and weathered tough questioning to take first place in the respective competitions. The team at ECTODECTO developed a library of novel copolymer platforms capable of detecting and treating ectoparasites. Their primary project, ‘Nit picking’ specifically detects and treats head louse infestations in an accurate, timely and safe manner. Biotechnology YES and Environment YES are co-organised by the Haydn Green Institute for Innovation and Entrepreneurship at The University of Nottingham, the Biotechnology and Biological Sciences Research Council (BBSRC) and the Natural Environment Research Council (NERC) with significant support from the Medical Research Council and industry. Professor Simon Mosey, Director of the Haydn Green Institute for Innovation and Entrepreneurship, said: “The 20th year of YES has been the most exciting yet. The teams have met the challenges we posed with breath-taking ingenuity and their ideas to address global warming, the ageing population and food security are truly exceptional. Claire Lewis, Managing Director of ECTODECTO said: “It’s amazing to win, the hard work paid off. We knew we did ourselves proud so this is just the icing on the cake, the standard was very high. The competitions involve early career researchers developing hypothetical but credible business plans for either biotechnology or environmental focussed companies. Team members act as directors in their company seeking equity investment from a panel of industry and science experts. Teams receive help and advice from expert mentors and guest speakers in areas including intellectual property, financial planning and marketing. Over the 20 years of the YES programme more than 5,000 early-career researchers have taken part and developed business skills in 1,125 teams. Every £1 of Research Council Funding for the YES programme has been matched by £2.89 from other sources. Former contestants have formed successful companies, developed business ideas and worked in industry, as well as pursuing collaborative academic careers. Professor Jackie Hunter, BBSRC Chief Executive, said: “In 2015, the Young Entrepreneurs Scheme (YES) reaches a number of remarkable milestones as it marks two decades in existence and its alumni surpasses 5,000. “I believe the success and longevity of YES is the result of genuine partnership on many levels aimed at a common goal of developing an entrepreneurial culture amongst researchers for the benefit of the UK economy. The winning team from ECTODECTO collect their award, left to right: Claire Lewis, Rosa Catania, Monica Mistry (heading dolls head), Georgina Marsh, Gudrun Fridgeirsdottir. Living in space – how will Tim stay at the Peake of fitness? Is it a world record? High hopes for hula hooper.